I spent part of Sunday morning weeding the garden [Yes, I was really doing the hated chore that is called Yard Work], noting the heavy prevalence of thistle, crabgrass, prickly lettuce and other undesirables in the lawn, when something buzzed near my head. Fortunately, not a wasp (I really don't like wasps, especially after several nested in the back of the mailbox and went after me when I reached in to pull out the day's mail - I think I ran screaming around the cul de sac - and yeah, I got stung twice). 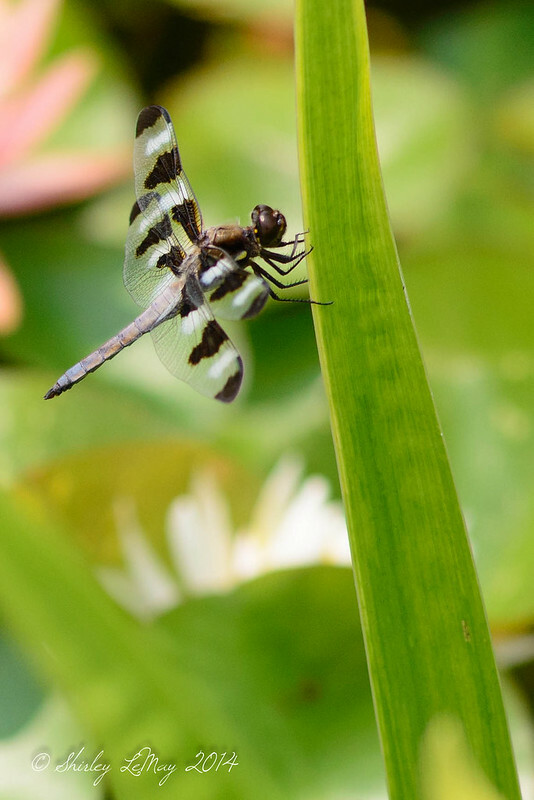 It was a harmless dragonfly, flitting around our fish pond - I watched the buzz of his wings as he circled around - at the high frequency of flight, his wings appear to be a blur of blue. The he grabbed one of the Iris leaves and settled into stillness. To my surprise, its wings weren't blue, but clear with black and white spots. He was a bit skittish - if I got too close, he would take off, circle around, but then find purchase again on the same branch or leaf. I was able to get several decently detailed photos before relinquishing my camera for the garden gloves. 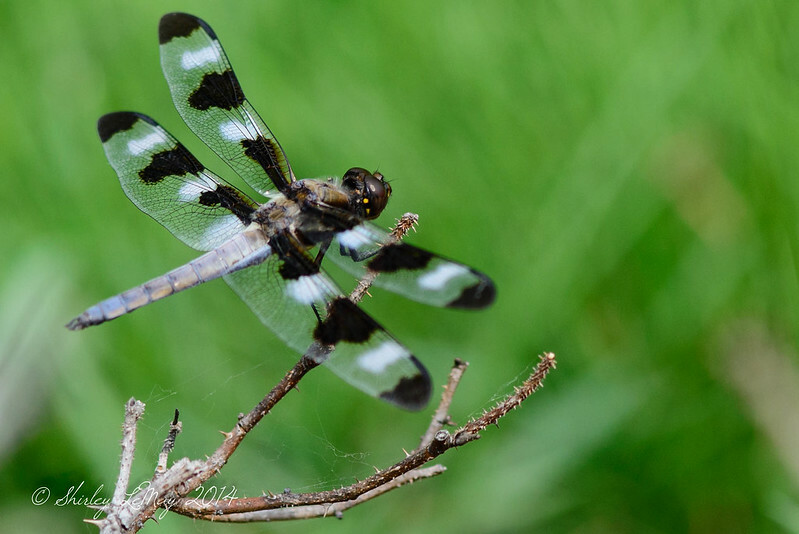 After some web research, I learned my subject was a male twelve-spotted skimmer. Although this dragonfly is fairly common, I was glad to have captured its amazing transparent wings. And with these photos, I've hit 10,000 uploads to my flickr stream. Great shot of this dragon fly Shirley! I always find these very difficult to capture as they seem to flitter around so fast . This is a really pretty one too! I've never been able to photograph a dragonfly - too skittish (them - not me). Yours is intricate and beautiful. Beautifully clear and wonderfully captured. Wonderful shots of this guy. I love seeing his little feet hanging on to the leaf. They are beautiful, aren't they? Happy Weekend!